In contrast to last week’s polar blast, this week in the forest has felt almost spring-like, with some warm winter sunshine and slightly lighter mornings and evenings. 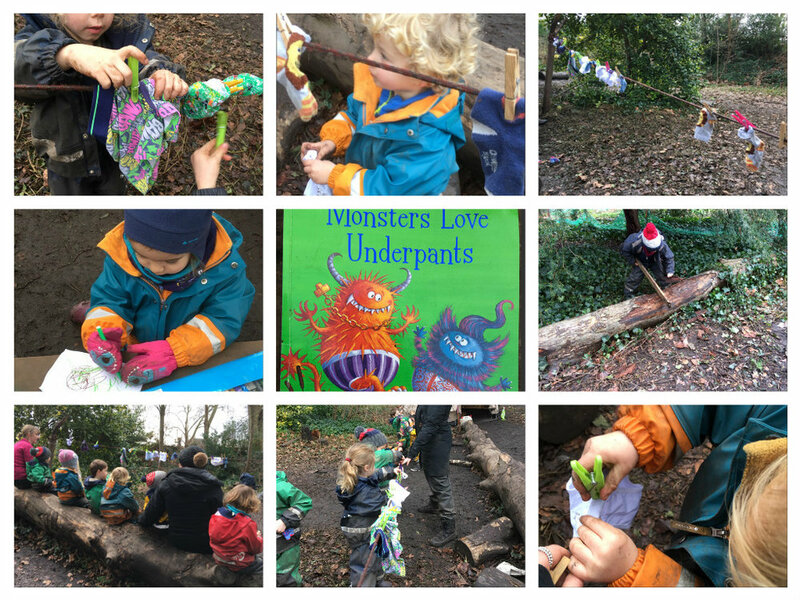 The children have taken advantage of not needing their gloves on all the time which has led to an increased amount of drawing and writing in the forest. The children have also started to notice that crocuses and daffodils are starting to poke their heads through the soil alongside the snowdrops all around Fulham Palace Gardens. This week one of the child brought in his favourite book from home “Monsters like underpants”. Katie read the story to everyone at lunch time which was met with laughter from all the children. They thought it was hilarious to hear a story about pants. After lunch, two children suggested that we make a washing line. Holly found some rope and wondered where they could tie it. The children stood by the two trees they thought would be perfect! After the rope was tied Chelsey wondered what the children might peg up. They had a think and shouted “pants!”. Where could there be pants in the forest?! Some children said they were wearing pants and suggested hanging them up but Chelsea quickly remembered the clean spare pants we have in the changing box. Chelsey and some of the children went to get the spare pants and some pegs. Chelsey then showed the children how to use the pegs whilst they watched carefully. Then, after a couple of demonstrations they were eager to have a go themselves. The forest was transformed into a wash and drying room with pants and socks hanging all around. The fine motor skills needed to pinch the peg and the coordination needed to hold the pants to attach them to the line was impressive to see. All the knot tying the children have been practicing over the last few weeks has really developed their skills. Our children got to practice their fine motor skills again this week in our cooking lesson when they learnt how to make soup. They peeled and chopped carrots, turnips, onions and leeks which they then added to the pot. When they discovered you could push the middle of a slice of leek they were delighted to see it extended like a telescopic lightsaber. The children became very excited and decided to make all the leek slices into lightsabers that Darth Vader and Luke Skywalker would have been proud of. When all the vegetables were chopped the children helped put them in the soup-maker along with a stock cube and some water. They ate their dinner while their homemade soup was brewing away and when it was ready everyone was keen to have a try. It was delicious! We hope you all have lovely weekends and see you next week! Newer PostChiswick - Snow glorious snow!